The airplane ranks as one of history’s most ingenious and phenomenal inventions—and surely one of the most world-shaking. 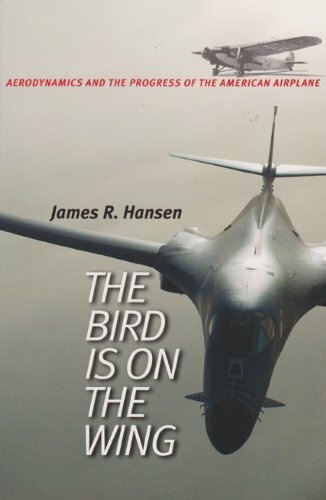 How ideas about its aerodynamics first came together and how the science and technology evolved to forge the airplane into the revolutionary machine it became is the epic story James R. Hansen tells in The Bird Is on the Wing. Just as the airplane is a defining technology of the twentieth century, aerodynamics has been the defining element of the airplane. Hansen provides an engaging, easily understandable introduction to the role of aerodynamics in the design of such historic American aircraft as the DC-3, X-1, and 747. Recognizing the impact individuals have had on the development of the field, he conveys not only a history of aircraft technology, but also a collective biography of the scientists, engineers, and designers who created the airplanes. From da Vinci, whose understanding of what it took to fly was three centuries too early for practical use, to the invention of the airplane by the Wright brothers, Hansen explores the technological matrix from which aeronautical engineering emerged. He skillfully guides the reader through the development of such critical aerodynamic concepts as streamlining, flutter, laminar-flow airfoils, the mythical “sound barrier,” variable-sweep wing, supersonic cruise, blended body, and much more. Hansen’s explanation of how vocabulary and specifications were developed to fill the gap between the perceptions of pilots and the system of engineers will fascinate all those interested in how human beings have used aerodynamics to move among, and even beyond, birds on the wing. If you have any questions about this product by Brand: Texas AnM University Press, contact us by completing and submitting the form below. If you are looking for a specif part number, please include it with your message. By Brand: Multi-Media Publications Inc.